Once upon a time in the year 2003, there was a magical land called “Tennessee”. In this magical land there lived a girl named Natalie (that’s me, ya’ll!). Natalie wasn’t from Tennessee, but had moved there from a place far away called “Chicago”. It was in this time and place that she met the boy of her dreams, though she didn’t know right away that he WAS the boy of her dreams. His name was Josh. He shaved his head and worked at a comic book store. Back in 2003, I was 19 years old. I know, right? A baby. Oh, and I was really skinny at this point. The skinniest I’ve ever been – 130 pounds. I was, in fact, living in Tennessee and working at a bookstore. I was dating a man much older than myself, and I didn’t have very many friends outside of my job. I almost never hung out with anyone aside from my boyfriend. I was a bit lonely, to be honest. 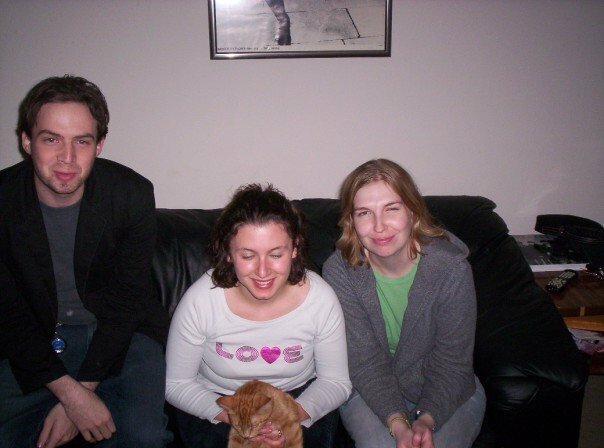 Sometime in February of 2003, my coworker Jennifer asked me if I’d like to come and hang out with her and her group of friends that weekend. She told me they liked to go out to Applebees and then bowling. She warned me that it wouldn’t be until late; probably sometime after 10 since everyone would be off work by then. I was very excited; I was going through a “Nobody likes me, everybody hates me, guess I’ll go eat worms” phase. Minus the eating worms, because that’s gross. I accepted her offer and that Friday (or Saturday.. hell, that was a long time ago and approximately a quarter of my brain cells have been eaten by my Zombie Baby) night I pranced my skinny toushie to Applebee’s. If you ask my husband today, he can tell you exactly what I was wearing – and he’d be right, because I remember. It was there that I met Justin, Thomas, Ryan, Shemaiah, and…. Joshua. I don’t have any pictures of those friends from then, but I do have this super great one of Ryan and Shemaiah from a few years ago. Ryan, me (and Ada) and Shemaiah circa 2005. You’re welcome, guys. My movie quote landed, and Josh responded with a laugh. The movie we were quoting was Interview With the Vampire, and no one I’d ever met before had recognized it when I quoted it. For some women, the quickest way to their heart is flowers, candy, or poetry. To me, it’s obscure movie quotes and pop culture references. If you can banter back and forth with me in movie quotes, we’ll get along just fine. Through the spring and summer I continued to hang out with the group, always enjoying everyone’s company but especially Josh’s. I considered him a male version of myself. I never entertained the thought of anything deeper than friendship then; I was in a serious relationship. I loved my boyfriend, and wouldn’t in a million years have cheated on him. Josh and I eventually began hanging out on our own – late night trips to IHOP while my boyfriend worked 3rd shift and after I had gotten off a late shift at Chili’s (oh, yeah, I had started working at Chili’s at some point. My bad. ), silly excursions to Wal-Mart at 1 AM. I visited him at the comic book store he worked at a few times and we shared many internet laughs. Like Trogdor the Burninator. While we were hanging out together, I began to realize something. This person wasn’t like anyone else I’d ever met before. He was kind, and generous, and he would do anything for his friends even if they had burned him a few times. He was loyal to the very end. He also treated me better than anyone had ever treated me before in my life.. Including my boyfriend. My boyfriend never physically mistreated me and I wouldn’t really say he did psychologically; but he had his “not so nice” moments and it was sometime in the summer that I realized that I wasn’t happy with him or the way he was treating me as a girlfriend. My best friend (Josh, duh) was being kinder, sweeter and more attentive to me and he wasn’t even getting any action out of me. It was around that time that I tried to break things off with my boyfriend the first time. My Very First Post-It Note Tuesday! Lambkins Baby Store – Wubbanub Review and Giveaway! My friend Nichole from the Pregnant After a Loss message board has an excellent website chock full of baby items called Lambkins Baby Store. I contacted her not too long ago to see if she’d be interested in hosting a review/giveaway here and to my delight, she said yes! We e-mailed back and forth a little bit to determine what would be best to give away. She mentioned that her little one, Xavier, loves Wubbanubs. I thought she was making stuff up and called her a liar, and told her to give me something real to review. Okay that’s not what happened at all, but I was confused as to what a Wubbanub was. a Wubbanub is a small stuffed toy that has a pacifier attached to it. Or a pacifier with a stuffed toy attached to it. Either way, it’s adorable and brilliant. I told her that Nellie wasn’t real huge on pacifiers, but that this would be an interesting way to find out if Wubbanubs were something really special and could convert my Nellie who is unimpressed with the paci most of the time. Once my Wubbanub arrived, I was eager to check it out. I opened up the package and released Wubbkitty from it’s box. I was actually surprised how small the kitty was; for some strange reason I was picturing a larger stuffed animal. I was happy with the size – I had actually worried about a huge stuffed animal being attached to my kid’s pacifier. I thought, “What if the Wubbkitty suffocates Nellie?” Right, Natalie, because companies would manufacture something that would suffocate a baby. Word to all you preggos out there: that Pregnant Brain thing you have going on DOESN’T GO AWAY WHEN YOU HAVE THE BABY. Anywhoo. I had laid Nellie down in her crib for some quiet time. I washed off Wubbkitty and brought it to her. I lay the kitty part down on her and offered her the pacifier. She took it a bit hesitantly, but once she had it in she seemed pretty content with it. The one problem I did have with it is that it’s kind of heavy at this stage. She’s not quite gotten into grabbing things yet so the weight of the kitten sometimes pulls the pacifier out of her mouth. But I do love how soft and squishy the kitten is, and once she does get into where she’s grasping things the size is perfect for her little hands. It is made with a Soothie medical grade, latex free pacifier. Easy to clean: place in washing machine with baby’s laundry, gentle cycle in mesh laundry bag. Allow to air dry. 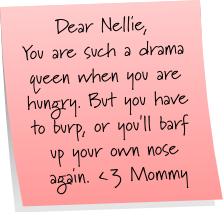 I’m really looking forward to seeing how Nellie takes to the Wubbkitty as time goes on; to see if she likes it as she becomes able to grasp things. Anyway, to what you’re all excited about I’m sure. The GIVEAWAY! Go to Lambkins Baby Store and go to the “Baby Toys and Gear” section. Tell me one item that you’d like from that category. Item MUST be from this category. In order to receive extra entries the mandatory entry MUST be followed. Extra entries WILL NOT COUNT if the mandatory is not met. MAKE SURE YOU ENTER EACH EXTRA ENTRY IN IT’S OWN COMMENT!! Become a fan of Lambkins on Facebook (be sure to include your Facebook name in the comment). and comment with the location of where the button can be found. Follow me on Twitter AND Tweet: “Win a Wubbanub for your little one from @karmapearl! http://http://tinyurl.com/ykkxqnd #giveaway #blog” and post the permalink of your Tweet. To find the permalink: After you’ve Tweeted, click on the time of the Tweet (located directly under your Tweet). Copy and paste the URL of the page you were directed to. You may Re-Tweet once a day. Be sure to post each Tweet in a new comment for credit! Follow my blog and leave a comment saying you follow. Tell me a funny story about your experiences with parenthood! This giveaway will end 4/12/2010 10:00 P.M. EST. I need a personal assistant to write down and record brilliant blog ideas when they strike me at inopportune times. Like when I’m sitting on the toilet. Or when I’m in the shower. Or when I’m, you know, on a roller coaster or something. Not that I’ve ever gotten an idea for a blog entry when I was on a roller coaster, but it could happen right? I got an idea for a fun blog post last night while drifting off to sleep. Before I lost it, I scrambled for my cell phone and sleepily recorded the idea in my notepad. I don’t know what made me think of it, but I figured it would be good fun for everybody! So here’s my idea. I’m going to post an old, embarrassing photo of myself from when I was a painfully awkward teenager with strange and fluffy hair. I’m going to explain the circumstances of the photo; where it was taken, what I was doing, what I was thinking with my wardrobe choice, etc. and I’m going to use that neat Mr. Linky Widget and I want you to submit your OWN Retro Photo: What Was I THINKING?! 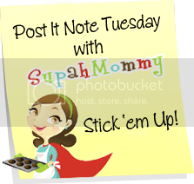 post and link it up on the widget. Sounds like fun, right? I’ll just give you a second to take all of that epic win in. That’s right. What’s the best part of this photograph? The dress? The hair? The platform sandals with the white ankle socks? Yes, folks, I have ALWAYS been as badass as I am right now. 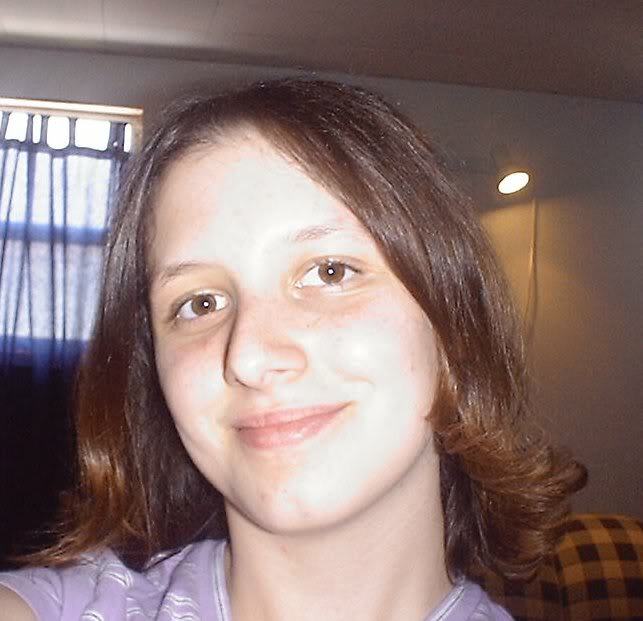 So this is me at the tender age of fourteen. I had no fashion sense then, as I have very little fashion sense now. I remember buying that dress. That dress wasn’t actually a real dress; it was a cover-up for a bathing suit. Aaaaaaaaahhh yeah. A bathing suit cover-up that I wore AS AN EFFING DRESS. WTF. And those sandals. Dear God, those sandals. I remember very clearly buying those. I was going through my Skechers phase and I fell in love with those sandals. As if the flat platform-ness of them isn’t heinous enough, I felt it was a good idea to throw on WHITE ANKLE SOCKS. Yes, Teenage Natalie, VERY FASHIONABLE INDEED. 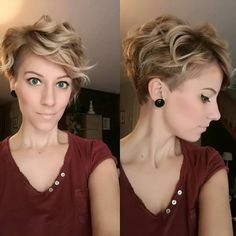 My “angular pyramid hair”.. I’m not real sure what’s going on with that business. I guess it was before I really was aware of how to handle my curls? I don’t know. It was summer, it was probably humid so that’s my story and I’m sticking to it. This photo was taken at my 8th grade graduation dinner. During the dinner all of the graduating class members (which was less than 15, I went to a small, private Lutheran school. Yes, me, I went to a Lutheran school and didn’t burst into flames upon walking through the doors) were given little gag gifts according to what they answer they gave on their graduation survey as to what they wanted to be when they grew up. I think I said “actress”. Yeah, I said “actress” which is not only oh-so-oirignal, but funny as hell because I can’t act to save my own life. Anyway I think what they gave me was a little “pretty princess” kit with a comb, brush, mirror, fake lipstick tube, etcetera. Sigh. I know there are other, much worse photos of me in existence. My aunt actually has several of me documenting when I was about 12 and went through my “hay bale hair, IOU sweater and stirrup pants” phase. God help me if I ever track THOSE photos down. So, now it’s your turn. Write your own WTF RETRO PHOTO post (WITH PICTURE!) and linnk it up here! Can’t wait to come and laugh at your awkwardness just like you’ve laughed at mine! Don’t be shy, share your epic “WTFness” with the whole blogging world! She’s back in town, and she’s angry that I kept her away for so long. Apparently Hell hath no fury like a menstrual cycle scorned for almost a year. BRB, eating all the chocolate in the world. Nellie’s 9 week birthday was yesterday but I missed it because her Uncle Drew (my brother) is in town meeting his niece for the very first time! We’ve been very busy. I didn’t take an “official 9 week video” but I did take this, which I hope you will all enjoy. Grips things with her toes. Got her first round of shots. Nellie screamed. Mommy cried. Daddy soothed. Mommy cried some more. So, without further ado, here is a little something from Nellie, featuring Daddy (and Uncle Drew watching Drag Race in the background). 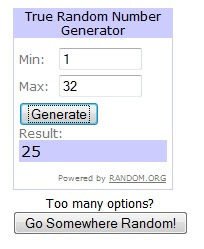 Angel Baby Sculpture Giveaway WINNER! Congratulations to Tabathia who is the winner of the Angel Baby Sculpture Giveaway! She will get a $35 credit at D Antonia’s Etsy shop for the Angel Baby Sculpture of her choice. In the middle of a day of errands your kid gets hungry so you find yourself huddled in the backseat of your car in the Wal-Mart parking lot feeding her a bottle (or breastfeeding) so she won’t have a meltdown in the store. You think to yourself, “What’s that smell?” only to realize that oh yes, it’s you.. Because you haven’t showered in two days. Also, you have a perpetual odor about you – I call it Eau Du Spit Up. You feel hungry, look at the clock, see it’s 3:00 PM and realize you still haven’t eaten even once yet. After a few days of worryingly “solid” poop, your baby’s diaper is back to it’s old “mustard-yellow-peanut-butter” look… And you cheer when you see it. You ask your spouse, “Does she feel hot?” eight times a day. You worry if she sneezes. You worry if she breaths too loudly. You worry when she stops breathing loudly. You have mastered typing on the computer, taking a phone call, and feeding your baby all at once (baby in lap propped on arm, phone propped on shoulder, bottle held up by chin). You stalk your baby with a camera and will sit there for 20 minutes waiting to catch a smile on film. For an overnight visit, you pack approximately half the baby items you own. When you put your child in a new outfit you have to take at least ten pictures of them in it. Every day you wake up with a smile because you can’t wait to see what that little one has in store for you. What do you think, mommies? 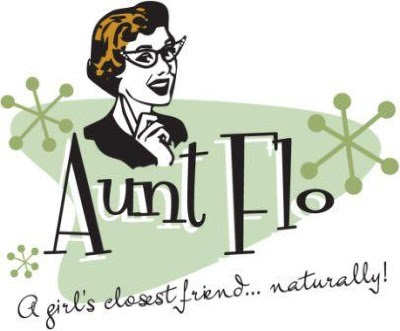 Add your other “You Know You’re A Mom When…” comments!